Nepal (Nepali : नेपाल), officially the Federal Democratic Republic of Nepal (Nepali: सङ्घीय लोकतान्त्रिक गणतन्त्र नेपाल Sanghiya Loktāntrik Ganatantra Nepāl), is a landlocked central Himalayan country in South Asia. 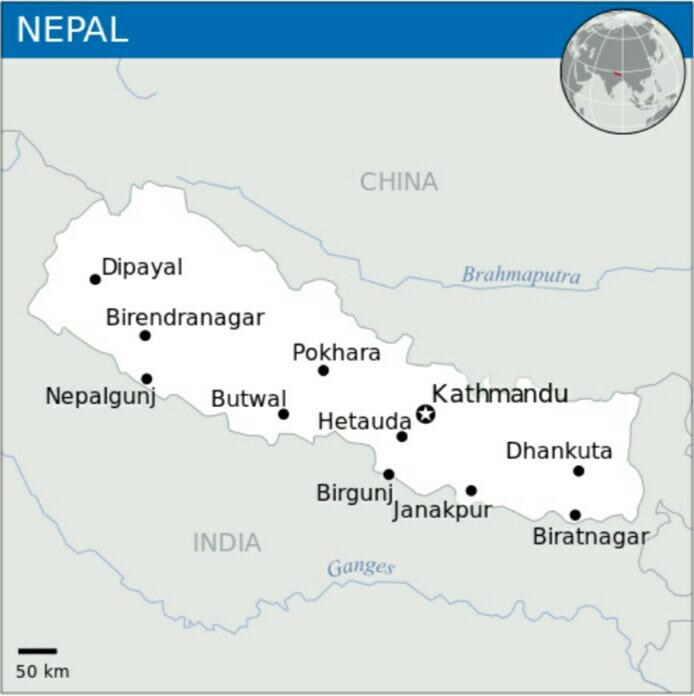 Nepal is divided into 7 provinces and 75 districts and 744 local units including 4 metropolises, 13 sub-metropolises, 246 municipal councils and 481 villages (5 states and 6,680 local units including 5 metropolises, 20 sub-metropolises, 358 municipalities and 696 gaunpalikas or rural muncipalites). It has a population of 26.4 million and is the 93rd largest country by area. Bordering China in the north and India in the south, east, and west, it is the largest sovereign Himalayan state. Nepal does not border Bangladesh, which is located within only 27 km (17 mi) of its southeastern tip. Neither does it border Bhutan due to the Indian state of Sikkim being located in between. Nepal has a diverse geography, including fertile plains, subalpine forested hills, and eight of the world's ten tallest mountains, including Mount Everest, the highest point on Earth. Kathmandu is the nation's capital and largest city. 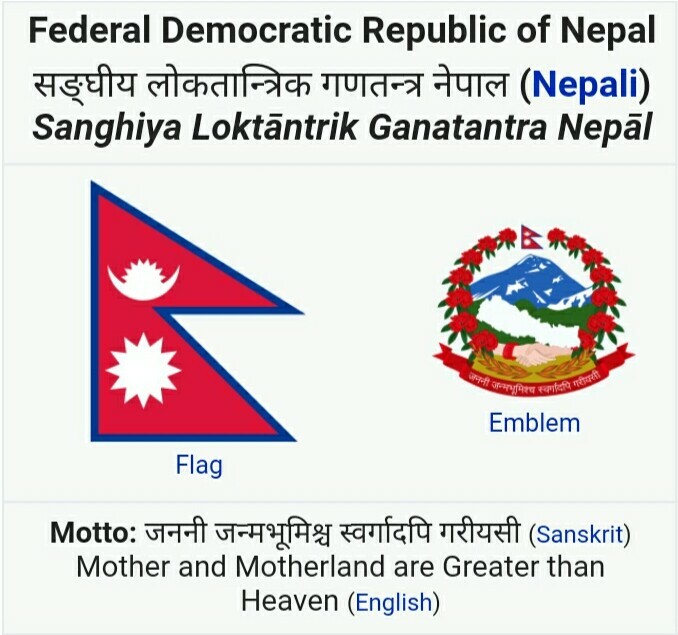 It is a multiethnic nation with Nepali as the official language. 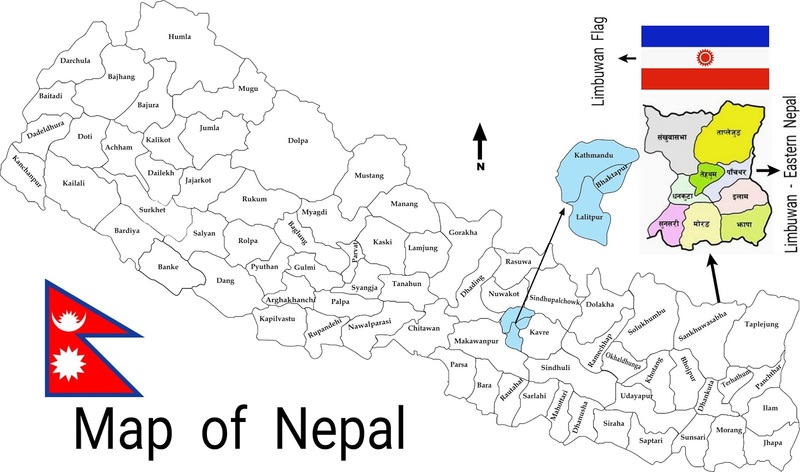 The territory of Nepal has a recorded history since the Neolithic age. The name "Nepal" is first recorded in texts from the Vedic Age, the era which founded Hinduism, the predominant religion of the country. In the middle of the first millennium BCE, Gautama Buddha, the founder of Buddhism, was born in southern Nepal. Parts of northern Nepal were intertwined with the culture of Tibet. The Kathmandu Valley in central Nepal became known as Nepal proper because of its complex urban civilisation. 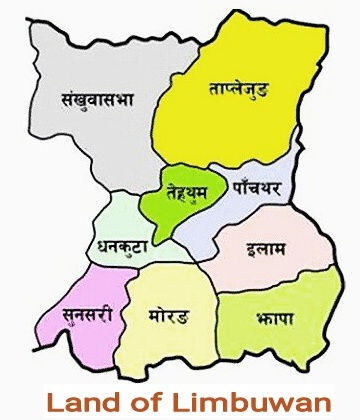 It was the seat of the prosperous Newar confederacy known as Nepal Mandala. The Himalayan branch of the ancient Silk Road was dominated by the valley's traders. The cosmopolitan region developed distinct traditional art and architecture. 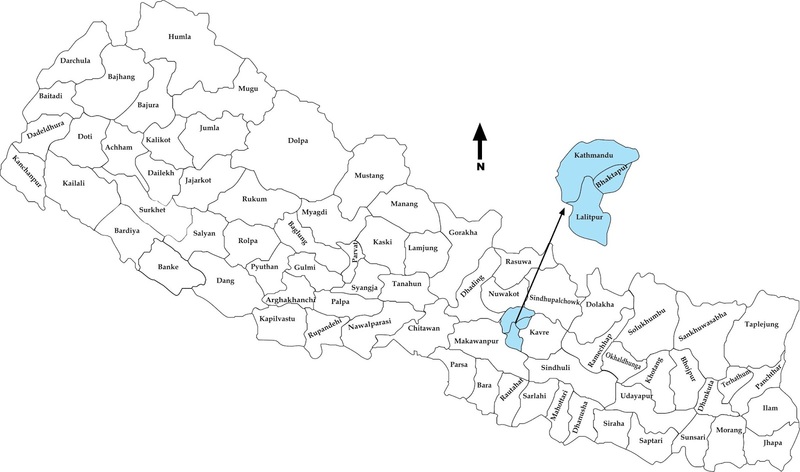 By the 18th century, the Gorkha Kingdom achieved the unification of Nepal. The Shah dynasty established the Kingdom of Nepal and later formed an alliance with the British Empire, under its Rana dynasty of premiers. The country was never colonised but served as a buffer state between Imperial China and Colonial India. In the 20th century, Nepal ended its isolation and forged strong ties with regional powers. Parliamentary democracy was introduced in 1951, but was twice suspended by Nepalese monarchs in 1960 and 2005. The Nepalese Civil War resulted in the proclamation of a republic in 2008, ending the reign of the world's last Hindu monarchy. Nepal's foreign relations expanded after the Anglo-Nepal Treaty of 1923, which was recognised by the League of Nations. After a Soviet veto in 1949, Nepal was admitted to the United Nations in 1955. Friendship treaties were signed with the Dominion of India in 1950 and the People's Republic of China in 1960. Nepal hosts the permanent secretariat of the South Asian Association for Regional Cooperation (SAARC), of which it is a founding member. Nepal is also a member of the Non Aligned Movement and the Bay of Bengal Initiative. The military of Nepal is the fifth largest in South Asia and is notable for its Gurkha history, particularly during the world wars, and has been a significant contributor to United Nations peacekeeping operations.